The history of the formation of the oldest football clubs is of interest to sport historians in tracing the origins of the modern codes of football from casual pastime to early organised competition and mainstream sport. The identity of the first or oldest football clubs in the world, or even in a particular country, is often disputed or claimed by several clubs, across several codes of football. Late[clarification needed] rugby clubs also referred to themselves, or continue to refer to themselves, as simply a "football club", or as a "rugby football club". "Club" has always meant an independent entity and, during the historical period in question, very few high school or university teams were independent of the educational institutions concerned. Consequently, school and university football teams were seldom referred to as "clubs". That has always been the case, for example, in American football, which has always had ties to college sport in general. Conversely, however, the oldest still-existing "football club" with a well-documented, continuous history is Dublin University Football Club, a rugby union club founded in 1854 at Trinity College, Dublin, Ireland, although there exists some record of Guy's Hospital Football Club being founded in 1843. While the first clubs emerged in Britain, possibly, as early as the fifteenth century, these are poorly-documented and defunct. For example, the records of the Brewers' Company of London between 1421 and 1423 mention the hiring out of their hall "by the "football players" for "20 pence", under the heading "Trades and Fraternities". The listing of football players as a "fraternity" or a group of players meeting socially under this identity is the earliest allusion to what might be considered a football club. Other early sporting bodies dedicated to playing football include "The Gymnastic Society" of London which met regularly during the second half of the eighteenth century to pursue two sports: football and wrestling The club played its matches – for example between London-based natives of Cumberland and Westmorland – at the Kennington Common from well before 1789 until about 1800. The Foot-Ball Club (active 1824–41) of Edinburgh, Scotland, is the first documented club dedicated to football, and the first to describe itself as a football club. The only surviving club rules forbade tripping, but allowed pushing and holding and the picking up of the ball. Other documents describe a game involving 39 players and "such kicking of shins and such tumbling". Other early clubs include the Great Leicestershire Cricket and Football Club present in 1840. On Christmas Day 1841, an early documented match between two self-described "football clubs" took place. The Body-guard Club (of Rochdale) lost to the Fear-nought Club after using an ineligible player as a substitute. The complete rules used in this game are unknown, but they specified twelve players on each side, with each team providing its own umpire, and the game being started by the firing of a pistol. A club for playing "cricket, quoits and football" was established in Newcastle on Tyne in or before 1848. The Surrey Football Club was established in 1849 and published the first non-school football list of rules (which were probably based upon the eighteenth century Gymnastic Society cited above). Windsor Home Park F.C. was in existence as early as 1854, and would go on to compete in early editions of the FA Cup. Cambridge University Association Football Club has been described by the university as the oldest club now playing association football. For example, : "Salopians formed a club of their own in the late 1830s/early 1840s but that was presumably absorbed by the Cambridge University Football Club that they were so influential in creating in 1846". According to Charles Astor Bristed, in the early 1840s at Cambridge, there were games played between clubs from colleges and houses. Cambridge rules dates from 1848 and football is documented as being played on the original club ground, Parkers Piece, as early as 1838. The earliest existing evidence of the Cambridge University Football Club comes from "The Laws of the University Football Club" dated 1856, and held at Shrewsbury School. It has been claimed that the present-day Barnes Rugby Football Club, from Barnes in London, is a continuation of the nineteenth-century Barnes Football Club, and moreover that the latter club was formed in 1839 and is thus the oldest club to have played football for its entire history. However, as of 2018, Barnes RFC's website claims only that the club was established in the 1920s, while alluding to "possibilities" that its history stretches back to 1862. Hence it is argued, and supported by the Guinness Book of Records, that Guy's Hospital Football Club, founded by staff at Guy's Hospital in London in 1843, is the oldest club. While a rugby club still exists at Guy's Hospital, the connection between the present club and the one formed in 1843 is still disputed. The oldest football club with the best-documented, continuous history is the Dublin University Football Club, founded in 1854 at Trinity College, Dublin, Ireland. The club plays rugby union. Sheffield F.C. in Sheffield, England, is the world's oldest surviving independent football club – that is, the oldest club not associated with an institution such as a school, hospital or university. It was founded in 1857. Sheffield F.C. initially played Sheffield rules, a code of its own devising, although the club's rules influenced those of the England Football Association (FA (1863) including handball, free kicks, corners and throw ins. While the international governing body of association football, FIFA and the FA recognise Sheffield F.C. as the "world's oldest football club", and the club joined the FA in 1863, it continued to use the Sheffield rules. Sheffield F.C. did not officially adopt association football until 1877. The only survivor among the FA's founding clubs still playing association football is Civil Service F.C. Six of the 18 founding members later adopted rugby exclusively. Cray Wanderers F.C. of St Mary Cray, London, founded in 1860, is the oldest club now playing association football in Greater London. The code played by Cray wanderers in its earliest years is unknown. Liverpool Football Club (not to be confused with Liverpool F.C. of the Premier League), later known as Liverpool St Helens F.C. were formed in 1857, which claims to be the oldest open rugby club in the world. The club adopted the Rugby Union rules in 1872, never playing association rules. English club Notts County, which has existed informally from 1862, is the world's oldest fully professional association football club. In 1858 in Melbourne, Victoria, members of the Melbourne Cricket Club formed a loosely organised football team, and played against other local football enthusiasts over the winter and spring of that year. The Melbourne Football Club was officially founded the following year on 17 May, and three days later, four members codified the first laws of Australian rules football. The Geelong Football Club was formed shortly afterwards, and over the next decade, many more Australian rules football clubs were formed in Victoria. Melbourne and Geelong were founding members of the Australian Football League (AFL), making them the world's oldest football clubs that are now professional. Lima Cricket and Football Club claims to be the oldest football-practicing club in Peru and the Americas, having been founded in 1859 by the city's British community. Having been established in 1875, Club Mercedes is considered the oldest association football club still in existence in Argentina. This places Mercedes above Gimnasia y Esgrima de La Plata and Quilmes, both founded in 1887. Buenos Aires Cricket & Rugby Club claims to be the oldest club still in existence in Argentina. According to the club's website, the club was founded before 8 December 1864 as a cricket institution. The date of foundation has been recognized by the Buenos Aires Rugby Union. It is however believed that the club was founded in 1831, with existing documentary evidence about a cricket match played by Buenos Aires that same year. Nevertheless, the practise of any "football" code did not start until 1951 when the BACC merged with the Buenos Aires F.C. and rugby union was added. Club Atlético del Rosario was officially established in 1867 as a cricket institution. The club soon added association football, being the first club from Rosario playing in the Primera División, the top division of Argentina. In rugby union, Rosario AC played the first inter-clubs match in the country on 28 June 1886, when the team faced Buenos Aires Football Club. 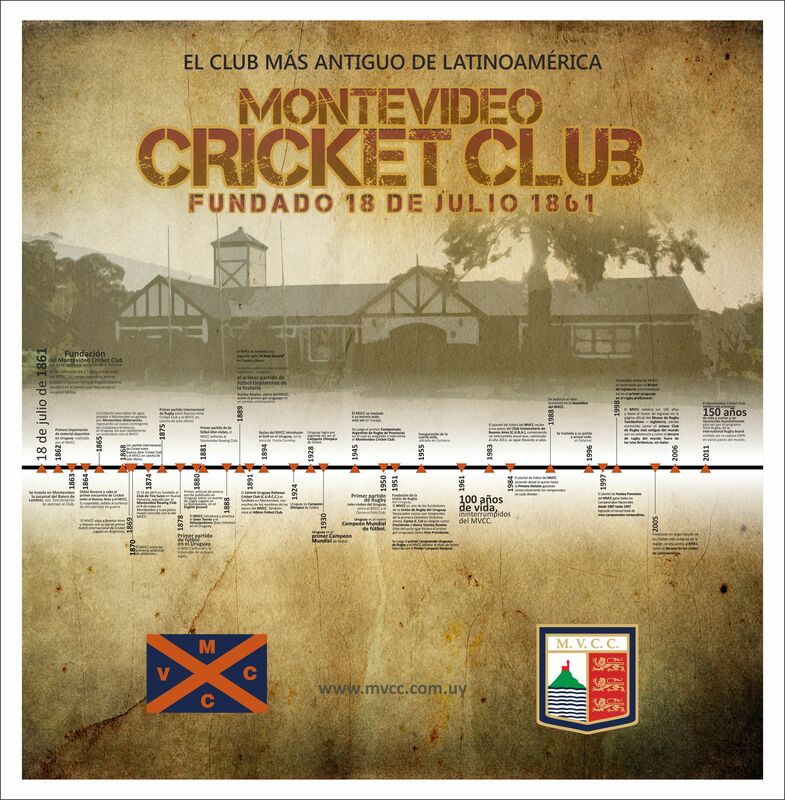 In Uruguay, the Montevideo Cricket Club, established in 1861, has however been ranked as the oldest rugby union club outside Europe by the World Rugby Museum of Twickenham, although the first certain rugby match played by MVCC was in 1875. São Paulo Athletic Club was founded on 13 May 1888 by English immigrants, and was the first football club in Brazil. Although association football is not practised anymore, SPAC still hosts rugby union. Santiago Wanderers was founded on 15 August 1892 by Irish community and was the first football club in Chile. Although football variants have been played in North America since the 1820s, the claim of oldest continuous football club in North America is still a matter of debate. Oneida Football Club of Boston, Massachusetts, established in 1862, was the first organized team to play any kind of football in the United States. The game played by the club, known as the "Boston game", was an informal local variant that predated the codification of rules for association, rugby or American football. The team, which consisted of graduates of Boston's elite preparatory schools, played on Boston Common from 1862 to 1865, during which time they reportedly never lost a game or even gave up a single point. In terms of gridiron football the Hamilton Tiger-Cats of the Canadian Football League can trace their roots back to the Hamilton Football Club (nicknamed the "Tigers") which formed in 1869, then later merged with the Hamilton Wildcats in 1950 to form the current franchise. Their rivals to the north, the Toronto Argonauts, were founded four years later in 1873 and have a mostly unchanged franchise history. Both clubs began as rugby football clubs and only later adapted to the gridiron-style of play which would become known as Canadian football. The oldest continuous rugby club in North America which still plays rugby is the McGill University Rugby Football Club which was established in 1863, although their first recorded game was not until 1865. The oldest independent (non-university) rugby club is the Westmount Rugby Club of Montreal, which formed in 1876. In 1869, Rutgers University and Princeton University competed in the first intercollegiate football game. According to U.S. Soccer, the rules of this game resembled rugby and association football more closely than gridiron football. These clubs evolved into the Rutgers Scarlet Knights and Princeton Tigers football teams which have existed continuously since then. In the United States, gridiron-based variants of the game did not distinguish themselves from existing codes until 1871, when Harvard University began playing a variation known as the "Boston Game." This allowed a player to pick up the ball and run with it if he were chased and it quickly spread, with innovations added by Yale University student Walter Camp. 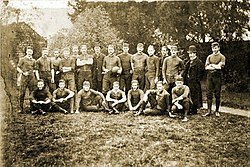 The oldest existing non-university semiprofessional football club is the Watertown Red & Black, which was founded in 1896. The Arizona Cardinals, formed in Chicago in 1898, are the oldest team in the National Football League. The first football club in France was established in Paris in 1863 by English expatriates, as the following excerpt from a contemporary newspaper shows: "A number of English gentlemen living in Paris have lately organised a football club.... The football contests take place in the Bois de Boulogne, by permission of the authorities and surprise the French amazingly." Le Havre AC was founded as an athletics and rugby club in 1872, making it the oldest surviving football club registered in France and continental Europe. They began playing association football on a regular basis in 1894. Technically AS Strasbourg could be considered the first French association football team, being established in 1890; they were however a German team at the time. Dresden English Football Club was founded on 18 March 1874 and was the first association football club in Germany, and likely the first outside Great Britain. In 1874, over 70 members participated, primarily Englishmen working in Dresden, watched by hundreds of spectators. Another German club, 1860 Munich did not play football until 1899, although it has its origins in a gymnastics and fitness club formed in 1848 and reestablished in the year indicated by its name. The Danish Kjøbenhavns Boldklub is the oldest football club on continental Europe. The club was formed in 1876 and association football was first played two years later. 1843 Guy's Hospital Rugby football Rugby union Blackheath England BUCS Football League Oldest documented football club in the world and founding member of United Hospitals RFC Now known as Guy's, Kings and St Thomas' Rugby Football Club. 1854 Dublin University Rugby football Rugby union Trinity College Ireland AIB League Oldest documented football club in Ireland and the oldest to later play Rugby union. Now playing in AIL Division 2. 1857, 10 November Liverpool St Helens Rugby football Rugby union Liverpool England North 1 West The club's first match took place in 1857 when old boys from Rugby school challenged local boys to a game under their school rules. Liverpool Football Club were then formed. The oldest open rugby club not part of an academic institution in the world. 1857, 26 December Edinburgh Academical Rugby football Rugby union Edinburgh Scotland Scottish Premiership Oldest football club in Scotland. Oldest documented rugby club in the UK. 1857 Edinburgh University Rugby football Rugby union Edinburgh Scotland BUCS Rugby Union Premier North B Joined the RFU in 1871 but resigned to become a founder member of the Scottish Football Union in 1873. The Edinburgh University Association Football Club (AFC) was formed in 1878 and was a founder member of the Scottish Football League. 1858/59 [a] Cambridge University Cambridge rules Association football Cambridge England BUSA Midlands Division 2A See above. The 1856/57 foundation date has been claimed by the university, which would make it the 2nd oldest club now playing association football. 1858 Blackheath Rugby football Rugby union Blackheath England National League 1 Foundation member of the FA. 1858 University of St Andrews Rugby football Rugby union St Andrews Scotland BUCS Scotland Div. 1 Founder member of the SRU. 1859, 14 May Melbourne Australian football Australian football Melbourne Australia Australian Football League A loosely organized side played as Melbourne on several occasions in 1858. The club was officially formed the following year on 14 May 1859. On 17 May 1859, members of the club codified Australian rules football. It is the world's oldest football club of any code that is now professional. 1859 [a] Melbourne University Australian football Australian football Melbourne University Australia Victorian Amateur Football Association Section A Records of its formation are lost, however there are references of the club dating back to June 1859 and its first match was also in June 1859. Won Australian rules first ever trophy in 1861 by defeating Melbourne. Disbanded during World War I, but later reformed. 1859, 18 July Geelong Australian football Australian football Geelong Australia Australian Football League The club's own code was played in the Geelong region and influenced the rewriting of the laws of Australian football in 1866. 1860, 20 May Ballarat Australian football Australian football Ballarat Australia Ballarat Football League Formed as a junior club; senior club established in 1862. 1860 [a] Cray Wanderers (Unknown) Association Football Bromley England Isthmian League Premier Division The early years of Cray Wanderers are poorly documented with its early history based on oral recollections later in the 19th century. Based on the frequently stated year of 1860, it is the oldest club now playing association football in Greater London., preceding Civil Service F.C., the only surviving foundation member of the FA, by three years. 1860 [a] Hallam Sheffield Rules Association football Sheffield England Northern Counties East League Premier Division Took part in first ever football tournament. Original club dissolved in 1886. 1860 Manchester Rugby football Rugby union Manchester England South Lancs/Cheshire 1 No connection to association football clubs Manchester United F.C. or Manchester City F.C..
1861 Sandhurst Australian football Australian football Bendigo Australia Bendigo Football League Founded by J. B. Thompson, one of the inventors of Australian rules football. 1861 Richmond Rugby football Rugby union Richmond England National League 1 One of the first two clubs (with Barnes) to play a game of Association football, despite not being a member of the FA. 1861 Sale Sharks Rugby football Rugby union Manchester England Guinness Premiership Currently in the peak domestic competition for rugby union in England. 1863 St. George's Hospital Medical School Rugby football Rugby union Hyde Park Corner England BUCS league, South Eastern Conference, League 2A Founding member of United Hospitals RFC, and the only one of the original United Hospitals members that is in the same form as at inception. The team moved to Tooting, South West London, in the 1970s. 1863 [a] Bradford Rugby football Association football Bradford England Conference North Founding member of Northern Union (RFL) in 1895. Changed codes in 1907 and renamed Bradford Park Avenue A.F.C., which folded in 1974 and reformed in 1988. 1863 [a] Stoke City Charterhouse rules Association football Stoke-on-Trent England Premier League While there are claims of a football club in Stoke formed by old boys of Charterhouse School in 1863 and this is the date given by the current club, little evidence exists of this entity, however there are contemporaneous reports in 1868 of the formation of Stoke Ramblers, which changed its name after a few years to Stoke Football Club. This club did not contest the FA Cup until 1883–84. Continuous history from reformation in 1908 following the wind up of the original club. It changed its name to Stoke City in 1928 after Stoke-on-Trent was granted city status. 1863 Christchurch Own code Rugby union Christchurch New Zealand Division One - Telecom Cup Oldest club now playing rugby union in New Zealand. 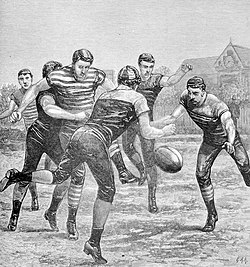 Australian football Rugby union University of Sydney Australia New South Wales Rugby Union Foundation date disputed by historican Tom Hickie who argues that it was actually 1865. The oldest Australian rugby union club; according to fullpointsfooty.net, it "flirted with 'Victorian Rules' [Australian rules] in its formative stages." The current Australian rules club at the university, Sydney University Australian National Football Club, claims to be a spin-off of SUFC, although the university did not play an inter-club Australian rules game until 1887. 1863 Royal Engineers (Unknown) Association football London England British Army competition Won the FA Cup in 1875. 1863 [a] Civil Service Association football Association football London England Southern Amateur League The only founding member of the FA that still plays association football. The other founding clubs now play rugby or are defunct. Also known as the War Office Club. 1864 Huddersfield Rugby football Rugby league Huddersfield England Super League The world's oldest rugby league club. It celebrated its 150th anniversary in 2014. 1864 Carlton Australian football Australian football Carlton Australia Australian Football League Source: Carlton Football Club. Carlton has participated at the highest level of its code longer than any other club. 1864 Williamstown Australian football Australian football Williamstown Australia Victorian Football League The second club from Williamstown which exists to this day. 1864 Brigg Town Association football Association football Brigg England Northern Premier League Division One South Traditional date. 1864, 8 December Buenos Aires C&RC Cricket Rugby union San Fernando Argentina URBA Primera A Although BACRC's itself sets the date of foundation "before 8 December 1864"., some historians claim that there is documentary evidence about a cricket match played by the club in 1831. 1865 West of Scotland Rugby football Rugby union Glasgow Scotland Scottish National League Division Three One of the founder members of the SRU. 1865 Bath Rugby football Rugby union Bath England Aviva Premiership Currently in the peak domestic competition for rugby union in England. 1865 Hull Rugby football Rugby league Kingston upon Hull England Super League The world's second-oldest rugby league club. 1866 Harlequins Rugby football Rugby union Twickenham England Aviva Premiership Founded as Hampstead Football Club, the club was renamed Harlequin Football Club in 1870 as the membership had ceased to be mainly Hampstead based. As the club's equipment and stationery was all monogrammed HFC, a dictionary was used to find an acceptable alternative name to Hampstead beginning with an H and all members agreed on Harlequin. 1866 Glasgow Academicals Rugby football Rugby union Glasgow Scotland Scottish National League Division Two One of the founder members of the SRU. 1867, 27 March Atlético del Rosario Cricket Rugby union Rosario Argentina Top 12 The first rugby union match (which was also the first inter-clubs match in Argentina) was played on 28 June 1886, vs Buenos Aires F.C..
1867, 4 September Sheffield Wednesday Sheffield Rules Association football Sheffield England Football League Championship The Wednesday Cricket Club formed 1820 in Darnall, Sheffield. Sometimes known as Darnall Wednesday C.C or Sheffield Wednesday C.C. In 1867 a football section was formed known as The Wednesday Football Club. In 1929 the football club officially changed its name to Sheffield Wednesday Football Club. 1868 Tiverton Rugby football Rugby union Tiverton England Tribute Cornwall/Devon League Tiverton Rugby Club is known as Devon's oldest club. 1869 Queen's University Rugby Football Rugby Union Queen's University Belfast Northern Ireland All-Ireland League AIB League, Ulster Senior League Second oldest club in Northern Ireland. 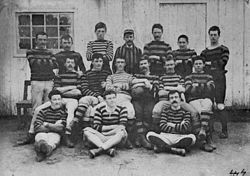 1869, 3 November Hamilton Rugby football Canadian football Hamilton Canada Canadian Football League The HFBC were nicknamed the "Tigers" in 1873. Merged with the Hamilton Flying Wildcats in 1950 to form the Hamilton Tiger-Cats. Oldest current professional gridiron football team. 1869 North Melbourne Australian football Australian football North Melbourne Australia Australian Football League Was briefly known as the 'Hotham Football Club' between 1877 and 1888, due to a change in the town's name. 1869 Kilmarnock Rugby football Association football Kilmarnock Scotland Scottish Premiership Scotland's oldest professional club. 1870, 12 May Port Adelaide Australian football Australian football Port Adelaide Australia Australian Football League Played in the SANFL until 1997 when it entered the AFL. Only pre-existing non-Victorian club to be competing in the league. 1870 Darwen Rugby football Association football Darwen England West Lancashire Football League The club was wound up in 2009 and later reformed as AFC Darwen. 1870 Reigate Priory Association football Association football Reigate England Surrey Elite Intermediate Football League Participated in the first ever FA Cup draw. Believed to be the oldest club in Surrey. Still playing on their original ground. 1871 Streatham-Croydon RFC Rugby Football Rugby Union Thornton Heath England Surrey 2 Founded as Streatham Rugby Club but later incorporated Croydon following a move from Streatham Common to Thornton Heath. 1872 Dumbarton Association football Association football Dumbarton Scotland Scottish Championship Founder member of the Scottish Football League, and joint winners of the first Scottish Football League title in 1890-1. 1872 Rangers Association football Association football Glasgow Scotland Scottish Premiership Founder member of the Scottish Football League, and joint winners of the first Scottish Football League title in 1890-1. 1872 Havre Athletic Club Rugby football Association football Le Havre France Ligue 2 Founded as Rugby and Athletics Club in 1872 by English expats. Oldest football and rugby club in France. 1872 Cefn Druids Association Football Association Football Wrexham Wales Welsh Premier League Year of 1872 claimed in clubs official history. Lots of discrepancies in clubs official history when compared to primary historical sources. Druids name does not appear anywhere until 1876. Druids merged with Acrefair United in 1923 to form Druids United. Druids United merged with Cefn Albion in 1992 to form Cefn Druids. 1873 Halifax Rugby football Rugby League Halifax England Championship Founding members of the Northern Rugby Union. 1873 Toronto Argonauts Rugby football Canadian football Toronto Canada Canadian Football League Founded as a rugby team by the Toronto Argonaut Rowing Club, itself founded the year previous in 1872. 1873, 1 October Kirkcaldy Rugby football Rugby union Kirkcaldy Scotland Scottish National League Division Two Founded in 1873 but played its first recorded match on 3 January 1874. 1874, 19 June Sydney Swans Australian football Australian football Sydney Australia Australian Football League Previously located and known as South Melbourne. Relocated to Sydney in 1981. 1874 Invercargill Blues Rugby Union Rugby Union Invercargill New Zealand Southland Premier Division Reputedly the oldest rugby club still in existence in New Zealand. 1874 Bolton Wanderers Association Football Association Football Bolton England Football League One The club was founded as Christ Church and was one of the founder members of the Football League in 1888. 1874 Aston Villa Association football Association football Perry Barr England Football League Championship Founded in 1874, also founder member of the Football League. 1874 Northwich Victoria Association football Association football Northwich England Northern Premier League Premier Division The foundation date of Northwich Victoria was at least as early as 1874. Founding member of the Cheshire FA, the Football League Second Division, The Combination and Cheshire County League. Their home ground Drill Field, at the time of its demolition in 2002, it was believed to be the oldest football ground in the world. 1875 [a] Lampeter Town Rugby football Rugby union Lampeter Wales WRU Division Four West Officially recognised by the Welsh Rugby Union as the oldest Rugby Club in Wales, when the Reverend Rowland Williams brought the game with him to the College in 1850. The club currently plays within the British Universities and Colleges Sports (BUCS) league system. Founder members of both the Football League and the Premier League. 1875 Dewsbury Rams Rugby Football Rugby League Dewsbury England Championship (rugby league) Won 2 Challenge Cups (1911–12, 1942–43) and 1 Championship (1972–73). 1875 Hibernian Association football Association football Edinburgh Scotland Scottish Premiership The Edinburgh derby match between Heart of Midlothian and Hibernian is the oldest regularly played derby match in the world. 1875 Club Mercedes Association football Association football Mercedes Argentina Torneo Federal C The oldest club currently competing in any Argentine association football league. 1875 Widnes Vikings Rugby football Rugby league Widnes England Super League Formed late 1875 as Farnworth & Appleton FC, becoming Widnes FC in May 1876 playing rugby rules although two games were played under Association rules versus Northwich Victoria in the first two seasons. 1875 [a] Newtown AFC Association football Association football Newtown Wales Welsh Premier League Year of 1875 claimed in clubs official history as this is the foundation date of Newtown White Stars. Newtown AFC formed in 1885 when Newtown White Stars merged with Newtown Excelsior. 1875 Montevideo C.C. Cricket Rugby union Montevideo Uruguay Campeonato Uruguayo The first sport practised was cricket, then adding association football and rugby. 1875 indicates the first registered rugby game by MVCC, although the sport had been introduced before. 1876 Old Foresters Association football Association football London England Arthurian League Forest School, Walthamstow, started playing football c.1857. The Old Foresters played from shortly after this year, the earliest recorded match versus Forest School in September 1864, but the club was not officially formed until 1876. 1876 South Adelaide Australian football Australian football Adelaide Australia SANFL South Adelaide is the 2nd oldest football club in South Australia. 1876 Chirk AAA Association Football Association Football Wrexham Wales Welsh National League (Wrexham Area) Formed in 1876 as Chirk FC. Welsh Cup winners on 5 occasions. 1876 Westmount Rugby football Rugby union Montreal Canada 2nd Division of Quebec Rugby Federation Oldest active rugby club (excluding university teams) in North America. Founded as Montreal Football Club. 1876 Port Vale Association Football Association Football Burslem England Football League One The club claim to have been founded in 1876, though contemporary research suggests the club was probably founded in 1879. 1876 Kjøbenhavns Boldklub Danish longball Association football Copenhagen Denmark Danish Superliga Formed in 1876, but association football was only added in 1878. The club itself claims to be the oldest football club in continental Europe. In 1991, Kjøbenhavns Boldklub and B 1903 merged their professional football teams and formed F.C. Copenhagen. 1877 Wolverhampton Wanderers Association football Association football Wolverhampton England Premier League Formed as St. Lukes, before merging with The Wanderers two years later. Founding member of the Football League. 1878 West Bromwich Albion Association football Association football West Bromwich England Football League Championship Founded as West Bromwich Strollers, before adopting the Albion suffix two years later. Founding member of the Football League. 1878 Everton Association football Association football Liverpool England Premier League Also a founding member of the Football League. The club played cricket for two years before adopting association football, so could be said to have been formed in 1876. 1878 Manchester United Association football Association football Manchester England Premier League Founded as Newton Heath LYR Football Club in 1878, the club changed its name to Manchester United in 1902 and moved to Old Trafford in 1910. 1878 Lugar Boswell Thistle Association football Association football Lugar Scotland Scottish Junior Football Ayrshire Division One Founded as Lugar Boswell and played until 1939 and reformed 1945 as Lugar Boswell Thistle. 1879 Swindon Town FC Association football Association football Swindon England Football League Two Founded as Swindon AFC in 1879, they became Spartans in 1880 and Swindon Town in 1883. 1879 Canterbury Rugby union Rugby union Christchurch New Zealand ITM Cup Oldest provincial rugby team in New Zealand. 1880 East Craigie Association football Association football Dundee Scotland Scottish Junior Football East Region North Division The Scottish Junior Football Association was founded in 1886. East Craigie pre-date this and are one of the oldest Junior (i.e., non-SFA) clubs still in existence. 1880 Antwerp Association football Association football Antwerp Belgium Belgian First Division Antwerp was founded in 1880 by English students as Antwerp Athletic Club. A football division named Antwerp Football Club was formed in 1887. It was the first club to register to the Belgian Football Association in 1895 and they later received the matriculate number one. 1881 Eastbourne Town Association football Association football Eastbourne England Southern Combination Premier Division Formed in 1881 as Devonshire Park, they played at the venue of the same name which is now the home of the Eastbourne International tennis tournament. Moved to their current ground of the Saffrons in 1886. Became Eastbourne F.C. in 1889 and Eastbourne Town F.C. in 1971. 1881 Watford Rovers Association football Association football Watford England Premier League One of the oldest clubs to never have won a major trophy. 1884 Derby County Association football Association football Derby England Football League Championship One of twelve founders of the Football League. 1884 Leicester City Association football Association football Leicester England Premier League Known as Leicester Fosse between 1884 and 1919. 1885, 20 February Richmond Australian football Australian football Richmond Australia Australian Football League A number of teams formed in the Richmond area during Australian rules football's rapid expansion of the 1870s, and early 1880s. However, all played at a junior level and it was considered an anomaly that Richmond, one of Melbourne's biggest locales, did not boast a senior team. The wait ended when the Richmond Football Club was officially formed on 20 February 1885. 1885 Bury Association football Association football Bury England Football League Two Bury were Second Division Champions in their inaugural season. 1885 Southampton Association football Association football Southampton England Premier League Formed as St. Mary's Y.M.A..
1886 North Shore United Association football Association football Auckland New Zealand Lotto Sport Italia NRFL Division 1 Founded as North Shore, NSU are reputedly the oldest extant football club in Oceania. 1887 Académica de Coimbra Association football Association football Coimbra Portugal Primeira Liga The oldest football club in Portugal and the Iberic Peninsula. 1887 Barnsley Association football Association football Barnsley England Football League Championship Initially formed under the name "Barnsley St. Peters" but dropped "St. Peters" to become simply Barnsley in 1897. 1887, 7 November Celtic Association football Association football Glasgow Scotland Scottish Premiership Founded in 1887 but played its first game against rivals Rangers in May 1888, winning 5-2. 1887, 27 November Quilmes Association football Association football Quilmes Argentina Primera B Nacional The club claims to be established on 5 November 1887, although some local historians stated that the original "Quilmes" club founded that year was later dissolved and the "Quilmes Cricket Club" was in fact a completely new institution, not related with other clubs previously founded in the city of Quilmes. 1888, 13 May Sao Paulo A.C. Association football Rugby union São Paulo Brazil Brazilian Rugby Championship First Brazilian football association and rugby union team. 1888 Northern Association football Association football Dunedin New Zealand FootballSouth Premier League Founded under its current name. Briefly renamed as Dunedin North End (1972–74) and North End United (1974–90). 1888 Roslyn-Wakari Association football Association football Dunedin New Zealand FootballSouth Premier League Founded as Wakari AFC. Name changed to Roslyn AFC in 1890. Team split into Roslyn AFC and Wakari AFC in 1895 before re-amalgamating under its current name in 1904. 1889, 22 March Sheffield United Association football Association football Sheffield England Football League Championship The oldest football team called United. 1889 Mohun Bagan A.C. Association football Association football Kolkata India I-League Calcutta Football League (CFL) It has been dubbed as the National Club of India and has the distinction of being one of the oldest football clubs in Asia, having been established in 1889. 1889, 23 December Recreativo de Huelva Association football Association football Huelva Spain Segunda División The oldest football club in Spain. ^ a b c d e f g h i j k l m Disputed, poorly documented or dormant for a period. ^ a b "Foot-ball". Bell's Life in London: 4. 12 December 1841. ^ a b "Foot-ball". Bell's Life in London: 4. 2 January 1842. ^ The Guardian, 10 June 1848. ^ "W. Runicles: Carver, Gilder and Picture Frame Maker [advertisement]". Windsor and Eton Express. 7 October 1854. p. 1. . A newspaper advertisement for W. Runicles, of Eton High Street, boasts of patronage by "H.R.H. The Prince of Wales, the Young Gentlemen of Eton College, and the Members of the Home Park Football Club". ^ "Cambridge University Newsletter July/August 2006" (PDF). University of Cambridge. July 2006. p. 4. Retrieved 11 July 2007. ^ a b "Cambridge... the birthplace of football?!". BBC Cambridgeshire. 13 June 2006. Retrieved 11 July 2007. ^ Bristed, Charles Astor (1852). Five Years in an English University. p. 365. ^ Inverdale, John (2 November 2005). "My assumptions about 'oldest' were confounded by Barnes". London: The Daily Telegraph. Retrieved 20 May 2010. ^ "GKT Gazette – March 2004 – A history of rugby". Guy's, King's & St.Thomas's Hospitals Medical & Dental Schools Gazette. ^ a b c London24, 2013, "The FA at 150: A look at the founder clubs". (24 March 2015). ^ Tony Collins, 2009, A Social History of English Rugby Union, Routledge, Abingdon, p. 14. ^ a b Joshua Barrie, "London's oldest football club, Cray Wanderers, could soon have a new home", This is Local London . (24 March 2015). ^ Eli Schmerler and Carlos Manuel Nieto Tarazona (14 March 2013). "Peru - Foundation Dates of Clubs". RSSSF. Retrieved 16 March 2015. ^ "U.S. Soccer Timeline". www.ussoccer.com. United States Soccer Federation. Retrieved 23 July 2018. ^ Hernandez, Anthony (15 May 2009). "Avec Louvel, "Le Havre est devenu un club de Ligue 2" selon les supporters". Le Monde.fr. Groupe Le Monde. Retrieved 20 September 2015. ^ "En kort version af vores klubs historie". kb-boldklub.dk. Kjøbenhavns Boldklub. Archived from the original on 2 July 2015. Retrieved 20 September 2015. ^ Hammer, Marie-Louise. "Kjøbenhavns Boldklub". Denstoredanske.dk. Gyldendal. Retrieved 20 September 2015. ^ "Famous Sons". Sheffield F.C. Archived from the original on 27 September 2007. ^ "Goldfields club endures". The Age. Melbourne. Archived from the original on 9 November 2007. ^ Morris, Terry. Vain Games of No Value? : A Social History of Association Football in Britain During Its Long First Century. ^ "The History Of Notts County". Notts County F.C. ^ "Rugby Union Football – History". The Encyclopedia of New Zealand. ^ a b "Sydney University". ^ "History of the Blues". Carlton Football Club. Archived from the original on 1 September 2007. ^ "Canadian Football Timelines (1860 – Present)". Archived from the original on 28 February 2007. ^ "Grey Cup 06 Newsletter". ^ "Here's hoping the Ticats turn it around". ^ South Australian Register, 13 May 1870. ^ Methven, John. "Club History - Kirkcaldy Rugby Football Club". Kirkcaldy Rugby Football Club. Retrieved 21 January 2018. ^ "History McGregor, avfc.co.uk". Archived from the original on 31 December 2010. ^ "Time called on Drill Field". BBC News. 19 October 2000. ^ "----THE WELSH CHAMPION FOOTBALL TEAM.|1895-04-27|The Montgomery County Times and Shropshire and Mid-Wales Advertiser - Welsh Newspapers Online - The National Library of Wales". newspapers.library.wales. Retrieved 4 January 2019. ^ "Information - Chirk AAA Football Club". www.pitchero.com. Retrieved 4 January 2019. ^ "Football Club History Database - Chirk A A A". www.fchd.info. Retrieved 4 January 2019. ^ The Valiants' Years: The Story Of Port Vale, ISBN 0-9508981-4-7, pages 4–13, 1990, The Port Vale Record, ISBN 0-9508981-9-8, page 4, 1993, and What If There Had Been No Port In The Vale? : Startling Port Vale Stories, ISBN 978-0-9529152-8-7, pages 18–33, 2011, all by Kent, Jeff. ^ Matthews, Tony (2008). Wolverhampton Wanderers: The Complete Record. Derby: Breedon Books. ISBN 978-1-85983-632-3. ^ "League to honour Founder Clubs". Football League 125. Retrieved 28 January 2015. ^ "Leicester Fosse 1884-1919". Leicester City F.C. Archived from the original on 2 May 2016. Retrieved 13 May 2016. 1824: The World's First Foot-Ball Club, John Hutchinson and Andy Mitchell. Andy Mitchell Media, 2018. ISBN 978-1-9866-1244-9.